I would like to present my hand painted oil on canvas painting (recreation) of the artwork SUNNY WAY. I made this piece with the same amount of soul and emotion just like the first original painting. This piece is created with oil paint on artistic canvas using my unique technique of a palette knife. The artwork has texture, you can feel the strokes by touching the painting. By purchasing on this site, you are buying directly from the artist Leonid Afremov. I guarantee your satisfaction and the best customer experience. · People who were born in the autumn live longer. · Lastly, many poets, composers and artists dedicate their works to autumn. And Leonid Afremov is one of them! We can clearly see it in this marvelous painting called ‘Sunnyway.’ Just imagine: the sky clears, the mist suddenly disappears from the streets and friendly sun beams tickle your face through the foliage. On days like this, autumn gives us the last sip of warm summer fragrance. It's so nice to walk in the autumn park illuminated by rich sunlight breathing in the smell of leaves, still wet after the rain, sodden ground and fresh air. At such moments, you want to stop the time and enjoy this beauty as long as possible. This exquisitely performed canvas shows us that autumn is a beautiful time of the year with inimitable landscapes and incredibly rich colors. In the picture, we can see how a couple walking hand in hand through a city park. The leaves have just begun to fall, and scattered rays of sunshine illuminate their way. The artist intentionally focused on yellow color to make the landscape more saturated. The palette is also abundant in red and orange hues. Besides, we can see a small amount of blue color that helps to set off the warm shades that prevail in the painting. This landscape has a specific sense. The author of the painting, Leonid Afremov, probably wanted to tell us that even in the worst of times our way is always illuminated by the beams of the sun. This canvas is not only a hymn to the magical season of autumn. When you look at it, you can feel hope appearing in your heart. Together with all the technical details of this amazing park view, you understand how big and difficult the work of the artist is. 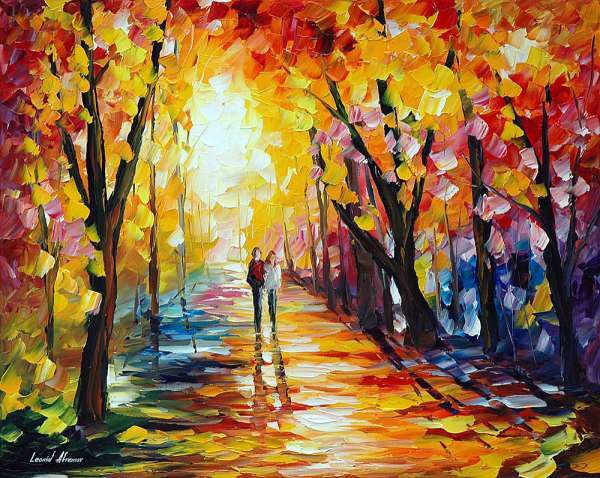 There are plenty of autumn panoramas in Leonid Afremov’s collection. Using deep and saturated colors to show the greatness of rainy landscapes, he strikes us with his inimitable style. 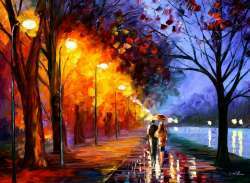 So if you really want to enjoy the splendor of autumn, you should definitely visit the artist’s site where you can also buy his canvases at an affordable price. His works will impress you and remain in your memory for a long time!